For a number of years now Jim Roberts and Norma Zimmer have provided moments of unusual enjoyment for millions of Americans. In the world of pure entertainment, longevity is synonymous with popular response. Norma and Jim have been premier performers for many years now courtesy of us, the American people, and Lawrence Welk. Mr. Welk ultimately decides who the performers will be; we feel his choice is just right! 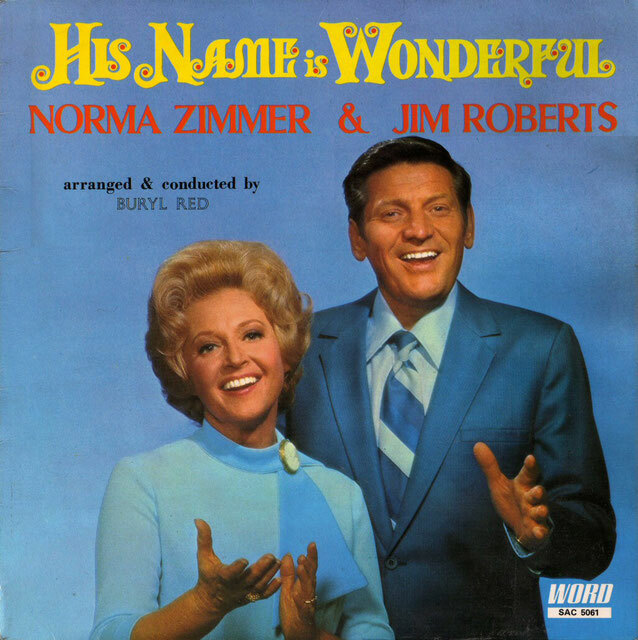 This is the third album by Norma and Jim. Their style of singing seems perfectly matched - it's as comfortable as a pair of gloves. they blend beautifully singing some of the most popular gospel songs of the day - and some songs that are ageless. HIS NAME IS WONDERFUL is a favourite and is performed by mass choirs around the world. thank you Audrey Mieir, for the inspiration with which you've graced the world! I wonder how often BEYOND THE SUNSET has been sung, played, whistled, and used as a source of comfort since Virgil Brock first penned the lovely lyric some years ago. You will enjoy having this recording in your home. The performances of hymns on TV by Jim and Norma have opened a door that has given many additional thousands an opportunity to hear them in person; in hymn festivals, in concerts, as solo performers in Billy Graham Crusades, and in churches everywhere. the creative arrangements on this album are by Buryl Red. Mr. Red is gifted in many areas of music, one of which is the art of arranging. you will also hear his lovely song entitled HIS GENTLE LOOK. I know, I know. When I bought this album I had a tiny sliver of hope that this was going to actually be about somebody called 'Wonderful'. You know, in the same vein as 'A boy named Sue'. I mean, there are some unusual names about. I once knew someone called Zachariah Puddlechuck, and that would make a great name for an album - 'His Name Is Zachariah Puddlechuck'. But no, with crushing inevitability, this turned out to be an album of Christian songs, extolling the virtue of some chap name of Jesus. Or Wonderful. I'm still not sure which. The sleeve notes warrant a bit of a further look. Firstly, longevity is apparently synonymous with popular response, apparently. Well look at Cliff Richard for a start. He's been around since the Pilgrim Fathers, and who wants to listen to his records? Oh yes, my Mother-in-Law. Alright then, maybe Jonathan King would be a better example. There's a man who is pretty much universally unpopular but who won't stop making his bloody songs. However, I am most concerned by the line 'You will enjoy having this recording in your home'. Is it me, or does that sound more like a command than a recommendation. Maybe it's the Teutonic tone of Kurt Kaiser's comment that scare the living bewonderful out me, but I'm scared. I'm scared because I have that album in my home, and I didn't (and don't) enjoy it. Will Mr. Kaiser come round in the dead of night, drag me off, and leave me bound and gagged and listening to his sacred music compositions. I sincerely hope not. The music sounds like a grown-up Elaine & Derek - a collection of sweet Christian tunes which all merge into one. I've always found that Christian music tends to err on the side of dull. Actually, there's a challenge for you - are there any Christian music albums that won't bore me to tears? A prize for anyone who can find one. Anyway, as I was saying, this album features 9 samey songs. Ah, but I hear you cry, "but there are 10 songs on this album, surely". Well, yes there are. Just as you think you can't take any more sweetness, side two starts with 'Sweet, Sweet Spirit'. This song has A COUNTRY TWANG. Not enough to be exciting or offensive, of course, but just enough to lift the tedium. It was at this point that I thought that this might yet have some saving grace - a sub-Carpenters kitsch that might just make this album worth something to me. All too quickly it sank back into the banal. I mean, yes, their voices are fine, the arrangements are a bit saccharine for my tastes and seem to my untrained ears to be somewhere between Andrew Lloyd Webber and Disney soundtracks. But it's all soooooo bland. There is however one very positive point about this album. It clocks in at just under 28 minutes. I tell you, I'll never have that half hour back again, but I was far more in the mood after it to thank Wonderful, if only for not having made the album a double. 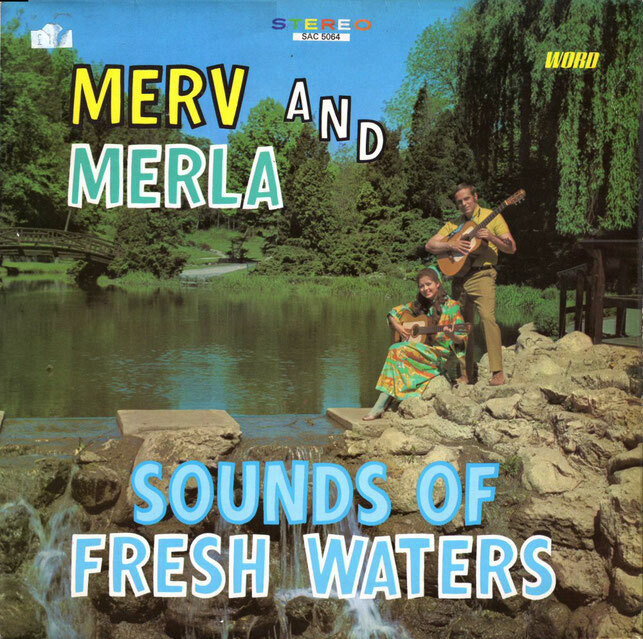 SOUNDS OF FRESH WATERS are exciting new sounds from Merv and Merla Watson, two remarkable musicians, well-trained and refreshingly creative. The music from this husband-wife team is a rare find in its up-to-date lyrics and original sounds that communicates with any audience. Merv and Merla are not like some folk singers you've heard. They have a different drive, an unusual commitment to their music and its message. The songs they sing are a part of them, for they have spent many long hours in composing, scoring, searching for the right words to please their audiences across their native Canada and the United States. Merla is accomplished as a vocalist, pianist and violist. In 1962 she toured the Middle East as soloist with the Canadian Broadcasting Corporation concert party entertaining U.N. troops. Merv, outstanding with the guitar and accordion, is a graduate of the University of Toronto and has taught music in the Toronto schools. Together the two originated the idea of the Schoolhouse Concerts in Toronto to stimulate interest in the performing arts as a means of Christian witnessing. The concert series met with immediate success, as did Merv and Merla, as they sang their own folk music at each concert. Recognition for the two came quickly and they began touring with their folk-gospel music, receiving acclaim for their ability. Audiences everywhere responded enthusiastically to their music that moves naturally, uninhibited by tradition or boundaries. This album is their finest work, sounds and feelings that are jubilant, some haunting in the contemplation of God, others crystal clear in lyric, all fresh and new, a symbol of their faith. I don't think I've ever met or known of anyone called Merla. To my 30something English ears, there's a certain exotic ring to the name. It conjures up 1950's mid-west diners, gingham and bitter coffee. For all I know, it could have the same connotations as 'Doris' or 'Mabel' over here, but there is a certain glamour I can't help but imagine. The picture of Merla in a very 1972 dress with her racy gold shoes does nothing to dim my excitement. The only thing that can do that is to listen to the album. I know that the job of the album blurb is to sell the album to the casual record browser, but you can't help but wonder how they can promise so much and yet deliver so little. In the case of Merv and Merla, I had considered a line by line breakdown of their claims against the reality, but I can feel a rant coming on, and would need a couple of aspirin and a good long lie-down if I went down that route. 1. The up-to-date lyrics reflect a two-millenia old system of religious beliefs. Not the most up-to-date now, is it? 2. Communicates with any audience? Surely that's the point of an audience, or am I missing something here? 3. Merla is "accomplished as a vocalist, pianist and violist". So why picture her on the album cover holding a guitar, an instrument which you seem to be saying she wields with all the grace of a lump-hammer? 4. Merv is a graduate of the University of Toronto is he? In what subject? Zoology? Physics? What? One other thing that bugs me is that poor Merla is relegated into second billing, even though alphabetically her name comes first, just. Is poor Merla just another victim of the misogyny of patriarchal society, or does 'Merv and Merla' just sound better than 'Merla and Merv'? You decide. The music itself is an odd blend. The album starts with a guitar sounding like a harpsichord, which leads into liturgical-influenced melody. It seems to be tripping over itself, but never quite falls. At times this album conjured up 1960s Leonard Cohen (that'll be the folk element then), and at other times, it reminded me of the soundtrack from 'Hair' (though being Christians, I kind of doubt that Merv and Merla would be cavorting naked, covered in body paint during their "Schoolhouse Concerts".) Some of it was quite Jewish in its influences, and it was only subsequently that I found out that Merv and Merla now reside in Israel. There's talk on that site of 'Merla's Miracle', a book detailing how Merla defied the surgeon's predictions after a 'bizarre' accident where a piano crushed her hand, and in fact did play professionally again. You will of course be pleased to know that in the cause of furthering my knowledge of the artists I present to you here, I have tracked down and purchased a copy of 'Merla's Miracle', and I will of course let you know in due course what the book's like. The most bizarre track however is 'The Time of The Singing Of The Birds' in which Merv and Merla whoop, holler and tweet like a pair of demented magpies. Sadly this track jumps on my copy, meaning I can't present it in it's fullness. But thanks to the wonder and diversity of YouTube, I found that someone had used it to enhance some video of some birds. So ladies and gentlemen, kick back, relax, and enjoy the freakish sound of Merv and Merla. On July 7, 1967, Billy Graham crossed the Yugoslav border above Trieste, en route to his first public meetings in Eastern Europe. We well remember the enthusiastic reception he received in Zagreb. During his EURO 70 Crusade, the evangelist "returned" to the same city when it joined 35 others to be linked with Dortmund's Westfalenhalle, in Europe's largest ever, closed circuit TV network. Although Mr. Graham has not yet visited Czechoslovakia, members of the team have taken his personal greetings to Christians there. They have confirmed my own conviction that God's people in Eastern Europe can be more closely identified with those described in the Book of Acts than any others we have seen. This record, introduced by Cliff Barrows leading congregational singing in Prague, captures something of the victorious spirit of these our fellow members of the Body of Christ. It is presented with the hope that it will encourage Western Christians to pray for them, as they pray for us, and thus strengthen the ties which bind our hearts in Christian love. What an oddity we have to mark the "long-awaited" return of forgottenalbums, a 1970 souvenir of Billy Graham's tour to Europe. I have to admit something of a vested interest here, in that in 1984 I saw Billy at Ipswich Town Football Stadium where his doom mongering, predictions of an imminent nuclear war and obvious showmanship had the opposite effect on me from that intended. Cliff's proselytizing bookends the musical content of the album, Christian music sung by a variety of Eastern European choirs and organisations. There's some diversity here, from the almost but not quite Welsh stylings of the Prague Male Voice Choir, to the instrumental pieces which sound like the soundtrack to a piece of avant-garde Soviet animation. However, my clear favourite by a country mile is the Bratislava Youth Ensemble. While the rest of the album provides foreign language versions of Western favourites or tunes embedded in Romantic folk, the Youth Ensemble are giving it large in a very 1970s Eastern European understated way. The songs are just that little bit more chirpy than the Wesleyan sounding hymns, and there's the acoustic guitar, so beloved on Christian Youth Groups. During 'Mary Magdalene', there's even a bass guitar, and you can tell that the bassist is just itching for an excuse to burst into 'Jazz Oddysey'. Thirty seven years on, their exciting, youthful glee sounds like every other progressive Christian Youth Group of the last couple of generations, only in Slovak. The rest of the album is.... curious. It's like trying to watch 'The Weakest Link' in a language you don't understand. You understand the format and the mechanics, but lack the comprehension. I have the tune of 'What a Friend We Have In Jesus' ingrained on my memory from years of Sunday School, but the novelty here is that it's in Czech. Almost like a cover version. Which reminds me, I have an excellent version of 'William, It Was Really Nothing' by the Smiths sung in German. 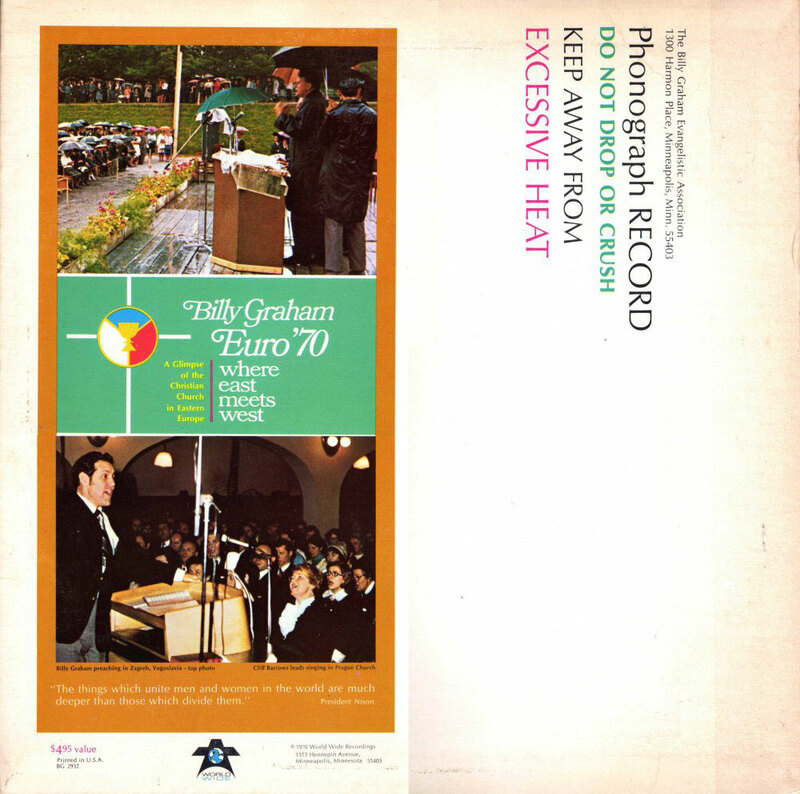 Nothing to do with Billy Graham, but then again, nor has this album really. 3 out of 10 for incomprehensible (to me) cover versions..
A man of the cloth seldom is able to take up a second occupation, yet it was as a singer, even more than as a Roman Catholic Priest that Father Sydney MacEwan was renowned. A Glaswegian born and bred, Father MacEwan studied at Glasgow University and at the Royal Academy of Music. This was followed by ecclesiastical training at the Pontifical Gregorian University, Rome. On returning to Scotland he discovered that his fine tenor voice so suited to the fine ballads of the Highlands of Scotland, attracted the friendship and enthusiasm of John McCormack, the celebrated irish singer, himself a possessor of a Vatican awarded title - "Count". MacEwan, while specialising in Irish and Scottish folksong, also sang and recorded classical, and semi-classical art songs and took this repertoire to Canada, USA and Australia on special leave from his post, attached to Glasgow's St. Andrews Cathedral. This collection of songs presents a cross section of Father Sydney MacEwan's favourite songs - from Scottish ballads to Stephen Foster and Handel. There is a theory that states that those of us unfortunate enough to spend the afterlife in the hot place with the guys with the pointy sticks, will find ourselves subjected to an incalculably malicious form of eternal torture, tailor made to draw out your own, personal nightmares. I had assumed that if such a place exists (and thankfully, I seriously doubt it...) I would end up spending all eternity melded, conjoined twin style, to a Roman Catholic priest. However, on listening to this album, I have revised my opinion to suggest that my own personal hell would be to spend all eternity melded, conjoined twin style, to this Roman Catholic priest. But it was the very priestly nature of the man that drew me to this album in the first place. Perhaps I should explain, but when selecting which albums to review, I take absolutely no notice of conventional wisdom, and judge the contents almost exclusively by the cover. The more creepy, dated, ugly, posed, vulgar or bizarre the album is, the more likely I am to pick it up and give it a whirl. My decision is probably 90% based on how much the cover made me laugh. Or squirm. Or vomit. I'm constantly amazed at what good condition these records are in. They've obviously been kicking around for 40 or 50 years, and yet they generally seem to be scratch free and in nearly mint condition. People have cherished these albums, and I wouldn't be surprised if each and every one had a prized place in someone's collection, only to be dumped, wholesale down the charity shop when they died. Somebody, sometime in the past was so enamoured with Father Sydney MacEwan (or at least his voice - having searched on the internet, he wasn't much to look at) that they went and bought this album. And it's shite. Really. Dreadful, dreadful shite. I don't even care that he's a Roman Catholic priest. I wouldn't buy this if it were recorded by my mate Dave. It's just awful. In the interests of fairness, I should probably qualify this. I'm sure that technically his voice is wonderful, and again, from what I found on this wonderful internet of ours, he was a fairly harsh self critic, and stopped recording aged 50 when his voice had "lost its bloom". I can only assume then, that he made this album when he was 70. I like to think I have fairly catholic tastes (see what I did there) when it comes to music. I'll listen to pretty much anything and try and find some merit. But this really isn't my kind of music. Maudlin old Scots singing maudlin Scottish songs in a warbly tenor? Just doesn't push my buttons I'm afraid. He sounds to my uneducated ears like the guy who sits in the corner of the pub, nursing his whisky, and sings, unbidden, at the end of every Saturday night in the hope that one of the regulars will buy him a drink. But at least that guys got passion. These songs are delivered in a manner so devoid of emotion that I wonder if they really were his favourites. I mean, I have no singing voice. Really. I tend to sing through my nose (which is a good trick if you can pull it off (the trick, not the nose that is)), so I shouldn't be criticizing others. However..... when I sing some of my favourites, I give them my all. Passion, vigour, showmanship, the works. I can't picture old Sydney even bothering to stand up to sing. And the arrangements of the songs? It's either Father Sydney and a lone guitarist or Father Sydney and a lone pianist. Not a banjo in sight which, after last week, is a bit of a disappointment. There's just not enough variation to make this interesting. But, the biggest disappointment, the cruelest blow, is that "I Dream of Jeannie" was not the theme from the TV show of the same name, but some dirge about a girl he once loved (yeah, right) with light brown hair who looks like a zephyr or something. I also think I should be congratulated on not making a quip about John McCormack's Vatican awarded title.